Eczema is a recurring skin condition which causes the skin to become irritated. It is a common condition and not contagious. 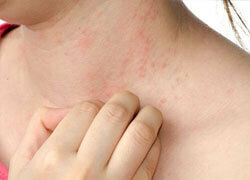 Atopic eczema is the most common form of the condition with the skin becoming red, dry, scaly and itchy. Eczema symptoms can be mild or severe, and can sometimes flare up and subside for no apparent reason. All types of eczema cause redness and itching, and some may blister, weep or peel. The condition typically affects the insides of the elbows, backs of the knees, and the face, but some types of eczema can cover most of the body. Skin affected by eczema is more vulnerable to infections. If you have eczema, it is best to avoid triggers such as environmental irritants and heat. Eczema may affect one in three people at some point in their lives. It usually appears in early childhood, between 2 to 6 months of age, typically on the cheeks and chin. It can also appear on the scalp, chest, back, arms and legs. It usually disappears around 6 years of age with most children growing out of the condition, or with it becoming less severe as they grow into adults. For a small percentage of children, eczema may continue on and off into adulthood, and sometimes it can even start in adulthood.